Human Dynamo has completed two projects for Kelly Tarlton's SEA LIFE aquarium. The first was an exhibition about the prehistoric Megalodon shark; the second was a life sized model of a Leatherback Turtle which was designed to withstand interaction with children. Human Dynamo are specialists when it comes to specimen model making, and especially in the case of sea creatures. We love going the extra mile to deliver beautiful, hyper-real models of sea creatures. 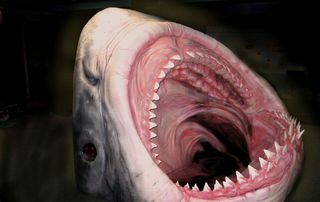 A huge megalodon shark head. Will sleeping beside the Leatherback Turtle.